Your parents wanted you to be a doctor…you decided to be a specialist in art crime? History seems to be full of those individuals that have crammed the accomplishments of several lifetimes into one. Strangely enough, I am not always a fan of the works they accomplish (Hemingway comes to mind), but am left in awe of a life lived fully. July 13, 1946, marked the end of a life such as this. Alfred Stieglitz – photographer, modern art promoter, gallery owner, magazine editor, curator, and overall perfectionist – was an overachiever, leaving a profound mark on the art world and on American art in particular. While studying mechanical engineering in Berlin, he by chance found himself in Hermann Wilhelm Vogel’s chemistry class. 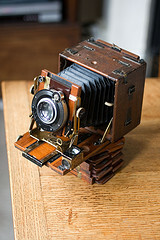 Turns out Herr Vogel was much more than a chemistry professor, he was also a photography pioneer. From this point onward, Stieglitz found a passion in the newborn art of photography that would stay with him for the rest of his life. In 1893, he married a woman named Emmeline Obermeyer, who was 9 years his junior. This was only the beginning of a trend in Stieglitz’s life: an enchantment with younger women. In 1896, Stieglitz succeeded in uniting New York’s two photography clubs – the Society of Amateur Photographers and the New York Camera Club – into the Camera Club of New York, which is one of the oldest arts organizations in New York City. He also served as editor of the club’s publication, Camera Notes. It could be argued that Stieglitz had some issues with delegating responsibility. He curated exhibitions, ran galleries, served as editor for multiple publications, discovered new artists, ran clubs, and continued work as a photographer, oftentimes simultaneously. The force with which he threw himself into his work would often result in breakdowns and retreats to his home on Lake George for much needed rest. His gallery 291 (previously known as the Little Galleries) was groundbreaking in many ways. He used the space to stage exhibitions of art and photography that were meant to challenge peoples’ notions of and reactions to art as well as force people to recognize photography’s place among other artistic media. Stieglitz served as honorary vice-president of the Armory Show, which in 1913 served as a watershed moment for modern art. In 1916, Stieglitz was shown some work by a young artist. So enamored with the artist’s work, he went ahead and displayed the art in his 291 Gallery without asking permission or even informing the artist. The artist, upon hearing their works were on display, marched into 291 and gave Steiglitz a piece of their mind. The artist in question? Georgia O’Keeffe. The two maintained a passionate relationship for the rest of Stieglitz’s life. Upon his death, O’Keeffe personally handled the task of compiling Stieglitz’s works and correspondence. 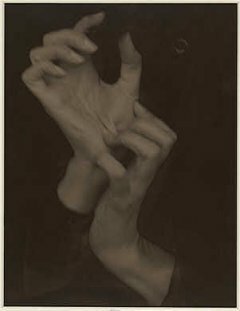 The National Gallery of Art (Washington, D.C.) One of the most extensive Stieglitz collections, including Georgia O’Keeffe – Hands (1919) seen below. 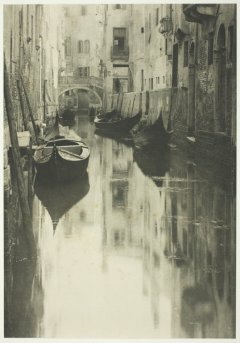 Art Institute of Chicago (Chicago, IL) Including A Venetian Canal, 1897 (Seen below). Make sure you also see the extensive Georgia O’Keefe collection. Boston Museum of Fine Arts (Boston, MA) including several portraits of Georgia O’Keeffe. Yale University (New Haven, CT) is home to many of Stieglitz’s manuscripts and correspondence. mu-se-um [myoo-zee–uh m] noun – A museum is a non-profit, permanent institution in the service of society and its development, open to the public, which acquires, conserves, researches, communicates, and exhibits the tangible and intangible heritage of humanity and its environment for the purposes of education, study, and enjoyment. See also Who Knows? An institution for the assembly and public display of any kind of collection, especially one of rare and/or educational value. [I]n Greece, originally a place connected with the Muses, sometimes in a religious sense, but more usually as a place where the arts and learning were cultivated. The museum came to mean a place of education, connected with the Muses. Over the centuries their functions and role have changed, although at their heart is the preservation and display of collections. 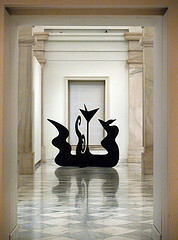 Museums define relationships between life, community, the nation, and the world through the interpretation of objects, experience, and the environment … The sheer variety of museums evinces the need to address different constituencies and to engage different interpretations of historic events that recover the multiplicity of cultures that constitute American identity. Valuable ideas or inner gifts that need to be dusted off and brought out into the world are suggested by a museum. How the dreamer relates to a museum may reflect the ways in which they relate to their material possessions. A building or institution devoted to the acquisition, conservation, study, exhibition, and educational interpretation of objects having scientific, historical, or artistic value. These words point to what is arguably the central purpose of museums: the collection. Acquiring objects, studying them, interpreting their purpose, displaying them, preserving them, and educating the public about their importance – this is what museums are all about. Or is it? Limiting the definition of museum to an institution with a collection immediately rules out entire categories of “museums” that exist today. For instance, what about virtual/online museums like the Museum of Online Museums at coudal.com? There is no physical space where the “collections” are housed, no mission of conservation, no actual objects on display. How about children’s museums? Some maintain collections, but most stress the importance of interacting with exhibits for the purpose of education and child development. What about museums that explore concepts rather than objects, like the Creation Museum or the Freedom Museum? Finally, what about zoos, aquariums and botanic gardens – does the fact that their collections are alive include them in the league of museums? There are people on both sides of these arguments, a debate between traditional and expansive ideas of what a museum makes. What is interesting to me is that all of the above definitions describe museums in a rather positive light. If you asked a non-museum goer, would they come up with similar descriptions? Where one claims museums are a place of exchange and education, others might say they are institutions of elitism and exclusion. Museums claim to tell the stories of humanity and its environment, but some would argue that they only tell the story of certain communities. Some of these critiques are unfair, while others completely justified. Museums have a checkered past, but the definitions should change as museums adapt to the expectations of the future. mu-se-um [myoo-zee–uh m] noun – It is what it is, until it is something different. 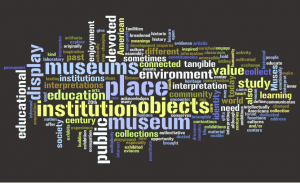 What is your definition of museum? Photo of the Week: Elephants March! 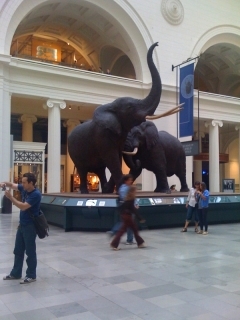 The elephants in the Stanley Field Hall at the Field Museum of Natural History.